"On June 7, 2001, Charles Schulz was posthumously awarded the Congressional Gold Medal in the Rotunda of our nation's capitol." The full script illustrated with screen art from the show --Photographs, storyboard excerpts, and production materials --Reminiscences and insider tidbits from executive producer Lee Mendelson and animator, the late Bill Melendez -- Interviews with the original child actors who were the voices of the Peanuts gang -- And much more! 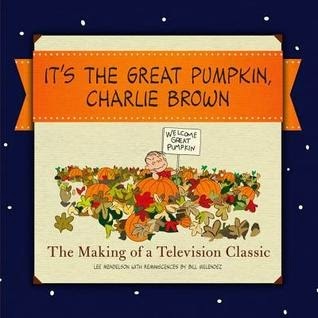 It’s the Great Pumpkin, Charlie Brown: The Making of a Tradition is the ultimate Halloween treat for fans of all ages. This book was so nostalgic for me, as I'm sure it would be for many. Before reading it, I sat down with Troy to watch the 20-minute classic on Hulu. And it was like being thrown headlong back into my childhood! I hadn't watched the special in ages, but it used to be a serious tradition on our house: since we didn't get to watch much TV, the Charlie Brown classics were a special treat (during which we also got to enjoy the rare bowl of ice cream!) for me and my sisters. Which made them even more special to us. It's funny, though, because I recall them as being movie-length to my childhood eyes. I was shocked to see that "It's the Great Pumpkin" lasted only a little over 20 minutes! If you don't have access to Hulu and still want to enjoy this book, though, not to worry! The entirety of the dialogue is laid out with stills from the show in the back fifth of the book, so even if you haven't seen the special in forever, you can easily "watch" it again to remember everything! I really liked that part, even though I wish I had known about it going into the book, so that I could have read that FIRST: would have made the rest of it even more enjoyable. However, it is understandable that it has been relegated to the back of the book, since the true features are the reminiscences by the show's creators, the interviews with the children who voiced the characters, and a feature on the composer who wrote the famous jazz accompaniments which truly made the show, I think. The book was chock full of factoids, which loyal readers may already know I adore. I'm a sponge for trivia. The more cool info you can give me, the better! So, once again, poor Troy had to listen to me share some fun new thing with him every few minutes. I would have my head buried in the book, and I'd surface just enough to read him some part I loved, and then I'd disappear again, engrossed (I am lucky to have such a patient partner - not to say he isn't as interested or excited by the facts as me, though! - so I'm lucky in that regard, too). One of the few that I marked was a fascinating section about why Schulz chose to make the Great Pumpkin a satire of Santa Claus. Firstly, it was because of the cartoonist's awareness of all of those families for whom Christmas might be a very difficult time, as they are unable to experience the "Santa Claus" who gives copious amounts of presents. And secondly, he figured that when children eventually learn that there is no Santa Claus, mustn't they also "wonder how many other things [they have] been told that are not true"? I loved to see such compassion from Snoopy's creator. Additionally, I learned from this book that Schulz was hugely against bullying, even back in the 1960s, when the issue was not nearly as discussed as it is today. Why is this? Well, because "Sparky" (as he is called by his friends) skipped several grades in school, and was of course an easy target for the bigger kids in his class. "So I guess part of the whole thing with the comic strip is Charlie Brown being picked on all the time and yet he survives...he keeps on trying. I assume a lot of people can identify with that." Does anyone else love Charles Schulz even more than ever after reading that quote? Because I sure do. All right - I won't give away ALL of the best parts, because then you wouldn't want to check out the book for yourselves! But if you feel the same nostalgia I do for Charlie Brown and the gang, I'd definitely recommend this beautifully laid out book. You'll see many familiar faces, but will come away with a new appreciation for the holiday special.